A quick glance at Chef's introductory remarks on the menu at Spice Mela serve as key indicators of the evening that awaits you once you are seated at one of the best restaurants in the city. 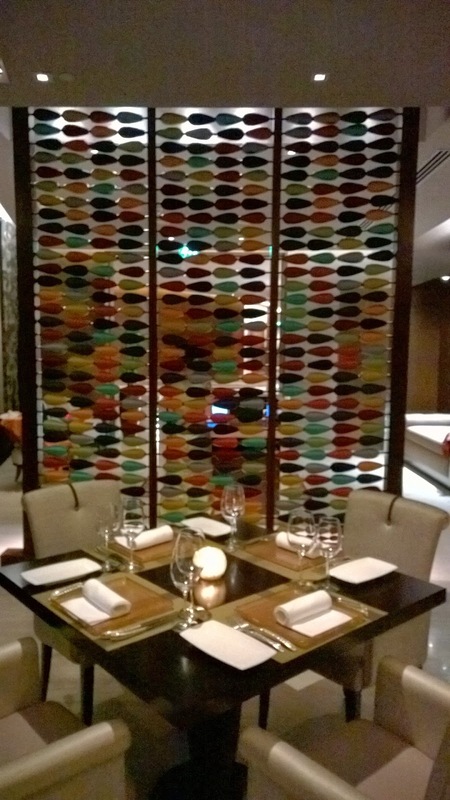 'Diverse regions', sophisticated Indian Gastronomy', and 'subtle yet complex marinades'. However, there are three key phrases that more than anything, is what makes Spice Mela what it is - 'using time honoured culinary methods', 'Spice Mela takes inspiration from the age old approach to dining' and finally, 'The menu remains true to classic Indian recipes, but also reflects the food trends in today's India'. It is this delicate balance between the past and the present that is understood so well by Chef de Cuisine Siddharth that makes Spice Mela so exciting. 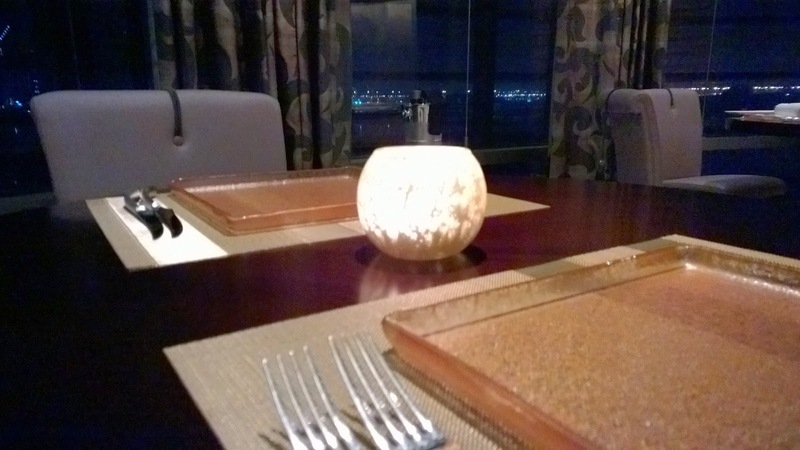 Attention to details, greta views and fine ambience. The service is something special. There is a tranquility and peacefulness that permeates the staff. Their expression never reaches a loud pitch. There is a rarified dignity and class about the staff, from the hostess to the waiting staff. My waiter for the night, Harish, embodies this. I opt for the tasting menu. 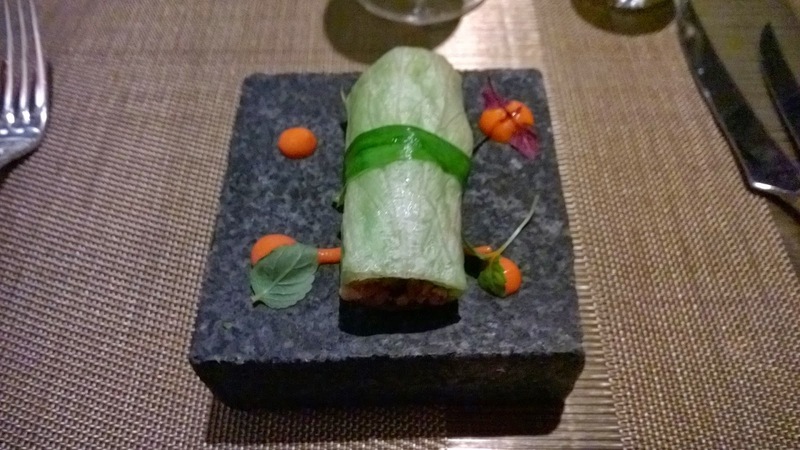 It starts with an amuse bouche of an understated but significant dish. It is Maska pav bread which accompanies Roasted butternut squash and coconut soup. 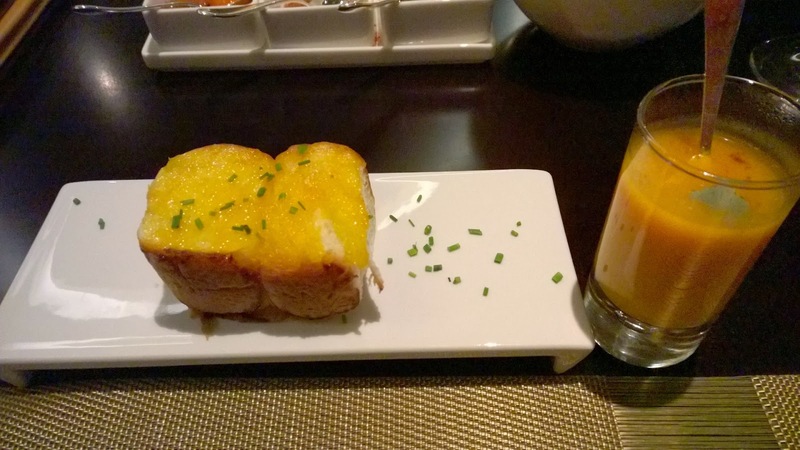 The bread, a typical snack on the streets of Mumbai, was inspired as a choice on the menu by chef's Siddharth's Summer vacation. Translated, it means 'to spread butter'. It is infused with Spice Mela's touch by having, instead of normal butter, carrrot butter, which brings a gorgeous yellow/orange colour. Sprinkled on top are some chopped chives. 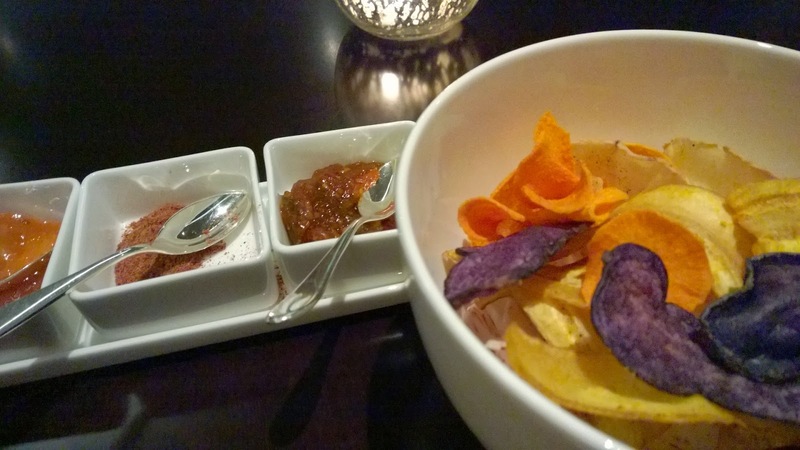 This simple street like dish is symbolic of what Spice Mela is doing, mentioned in my opening to this review. On its own it is delicious. The bread is so soft it is almost unnatural. Dipped in the soup, divine. The soup itself also delights and I scoop up a bit, my mouth is met by something chewy. It is dhokli, the Indian equivalent of gnocchi, popular in Gujarat. A stellar start. 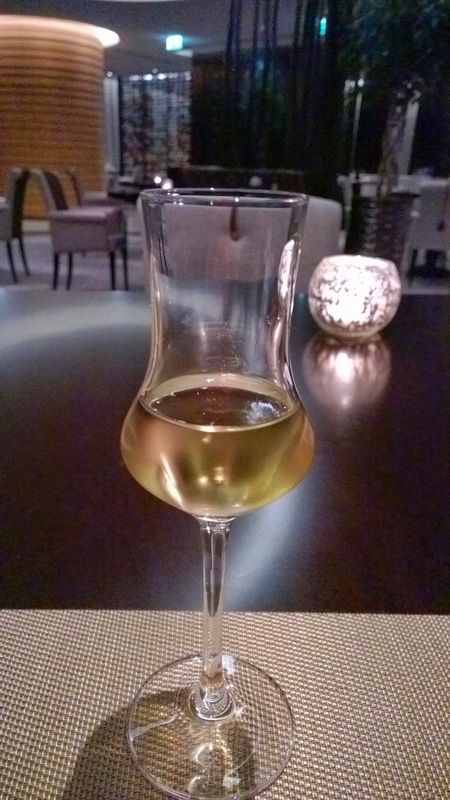 With a glass of Villa Sandi Prosecco in hand, the evening has certainly got off very well indeed. 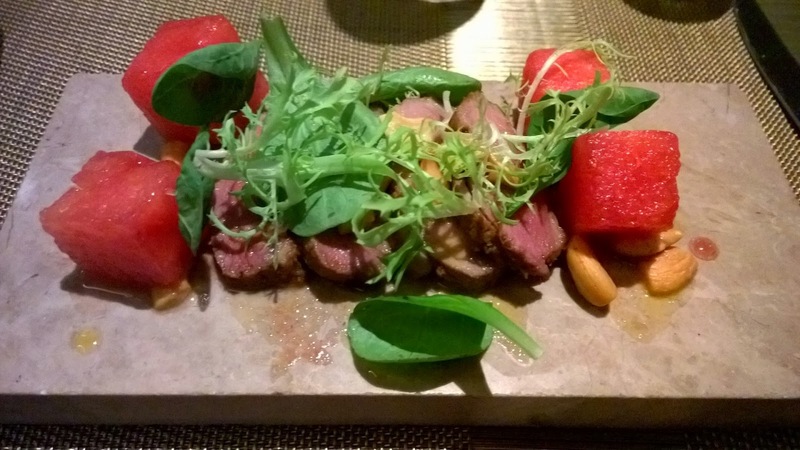 The next dish is the Tandoori duck and watermelon salad. I am arrested by a few things - the perfect medium rare to medium cooking of the duck, the marvelous colours on the rectangular flat stone serving plate - (no traditional plates for the starters), the textural paradise stemming from the soft, melting watermelon, the crunchy cashews and tender duck. All of this is held together by an immaculately balanced use of masala. Wonderful. The watermelon provides a bit of respite if the masala is too hot, not that it is. I think it is just the consummate dish. Soon after this, I have a Chicken wrap, but instead of it being wrapped in thin bread, it is wrapped in an iceberg lettuce leaf. The bell pepper chutney adds a lights sweetness to the dish that does not, though, detract from he mild spiciness of the tandoori chicken. As we move on, the dishes become more substantial. 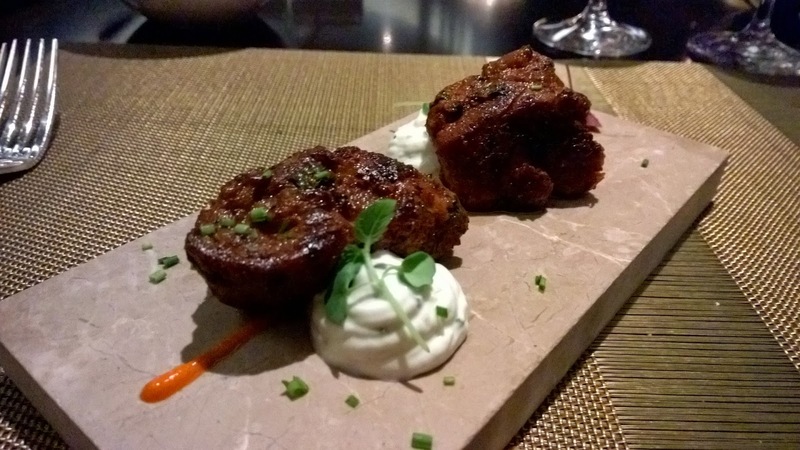 Harish next serves the Rajasthani Lamb Kebab which is brought with a rich aroma of spices. It is the spiciest of the dishes thus far, but from my last visit, Chef Siddharth recalls that I enjoy spicy dishes, so I have no issues. While his interpretation of the dishes is so essential to guests having an authentic pan-Indian experience, the time he spends at each table during the night allows guests to share their preferences with him. That is the beauty of a restaurant with indoor seating of around 55 people. It is more personalised. The wine, A Montes Cherub Rose´ from Chile is actually a lovely wine despite the off-puting label. From the Syrah grape variety, the wine has a striking red-pink colour. Surprisingly refreshing, perfectly dry. 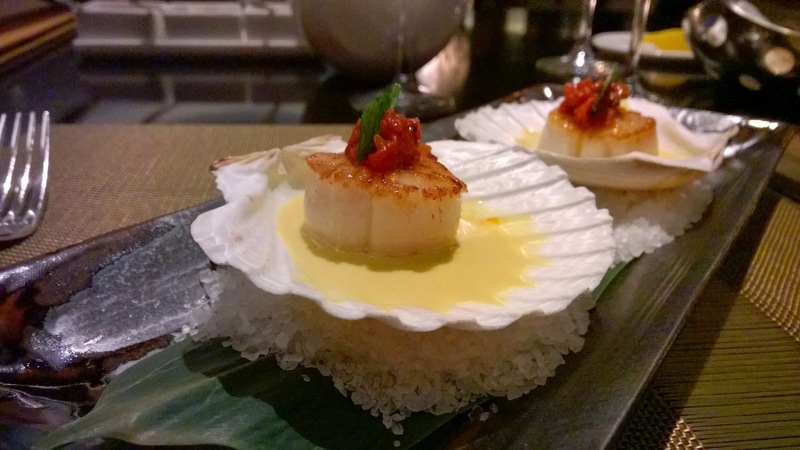 Chef Siddarth is a big fan of cod, and while I was looking forward to the dum ki macchi, I am eagerly awaiting his new dish with cod as the centrepiece. This time the cod dish is a lot more complex, just from looking at it. 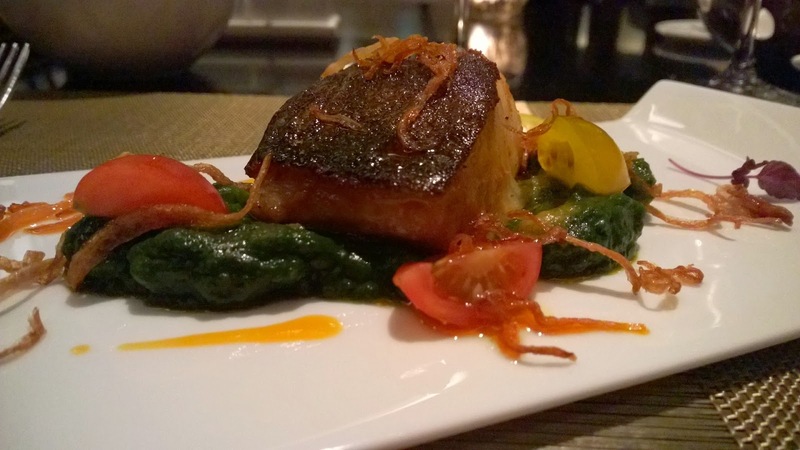 The Masala roast black cod is stunning. It is again well cooked so that as I poke it with my fork, it effortlessly flakes. I try some on its own - It tastes so creamy. How do you cook something so well without drying it out, I wonder to myself. The cod is on a bed of palak which imbues the dish with a dark green colour but adds another dimension to the cod. While there is saltiness in the palak, there is sweetness in the caramelized onions. Complemented to the tee! Thoroughly enjoyable. Although it is good to have variations of classics on your menu, it is also good to pay hommage to certain dishes by not interfering with hem, and serving them in a very traditional way. This is the case with the curries that are served. 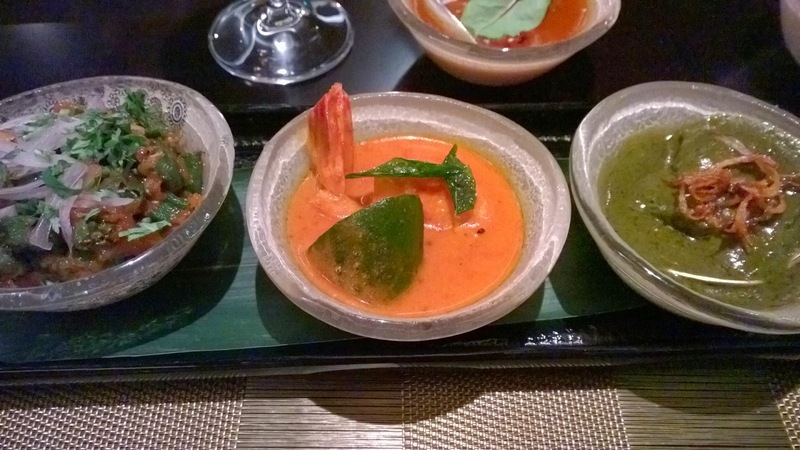 Calcutta Prawn Curry, Konkan Green Chicken and Bhindi Singhara Do Pyaza are served as perfect portions. The last two are exemplary. The green herbs and green chili are intoxicating, and even before I try it, the smell is very provocative. The tatse does it justice. The chili and mint wow me! Finally, and this is a surprise, I love the Bhindi Singhara Do Pyaza. The dish, described as okra tossed with water chestnut & roasted sesame seeds, works because of the way the okra is cooked. They are not too soft. Unless you have grown up eating okra, the texture can be difficult to embrace. Tonight it is cooked just right. Finally, the water chestnut is firm and crunchy, making this a really good curry. So good. After some phenomenal dishes, I am in two minds about having dessert. I would like those intense flavours to linger, but when I see the new dessert menu, any doubt I had is soon erased. 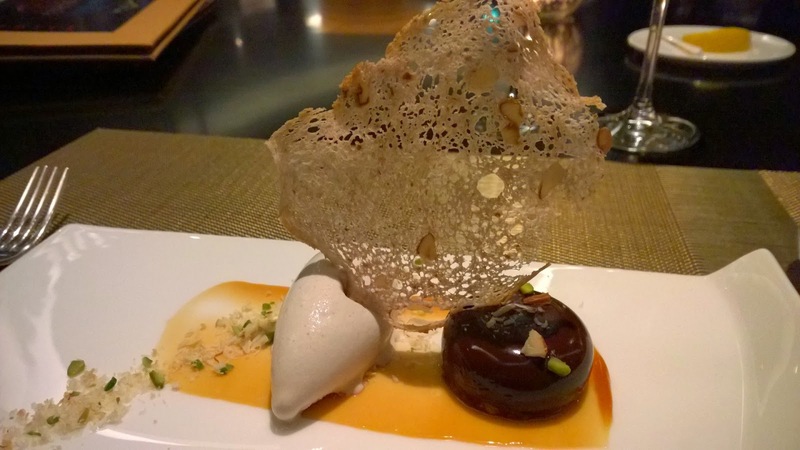 The Stracciatella banana kulfi looks thrilling because it involves flambéed caramelized apples, but I choose the Dark chocolate wattalapam and the Garam masala rice brulée. The Dark chocolate wattalapam is up first. 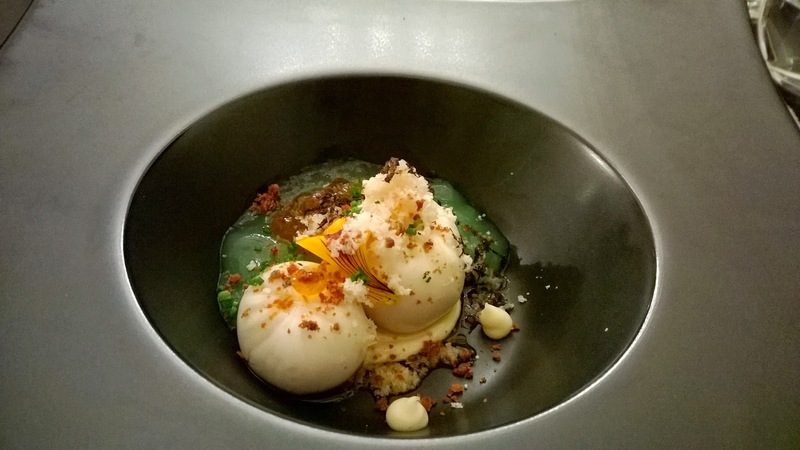 Walnut ice cream, hazel nut praline and 70% dark chocolate are presented, all brought together by brown bread crisp and jaggery, which forms the base of the dessert - it is a smear on the plate though. Nice. What I like here is the distinct lack of over-sweetness that one associates with Indian desserts. Pan-Indian. Nice again. The winning dessert though, is the Garam masala brûlée. Everything you could want in a dessert that exemplifies contrast in taste, colour and texture and cuisine is here. This dessert consists of rice pudding with a carmelised top and black cherry granita on top. It is crunchy, chewy and smooth. It is sweet and tangy. You get the full complexity of it by scooping all the way down the bowl. Then close your eyes and imagine the streets of Paris and Sicily meeting the streets of North India or South India. Then enjoy. Every scoop. What a marriage of influences and cuisines. What a dessert. What an evening! In sanskrit 'Mela' means 'to gather' or 'to meet at a fair'. It has a festive overtone. Spice Mela, therefore, is a gathering of spices, a festive celebration of spices. It spans the ages though. So, while the menu is a celebration of India past and present, I feel the concept of gathering is timeless. 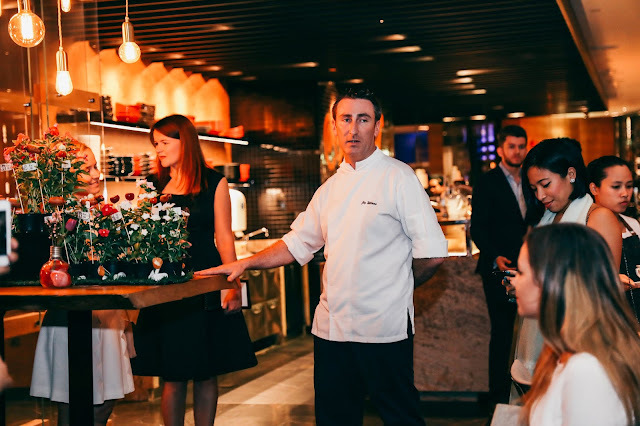 In the context of the restaurant, furthermore, it is also a gathering of people who have been drawn to a concept that exhilarates and also provides comfort. Exciting because of the new inventive creations, but also comforted because the old and reliable can be found here too. It is an effortless, natural coming together, gathering. Spice Mela is more than a fine Indian restaurant. 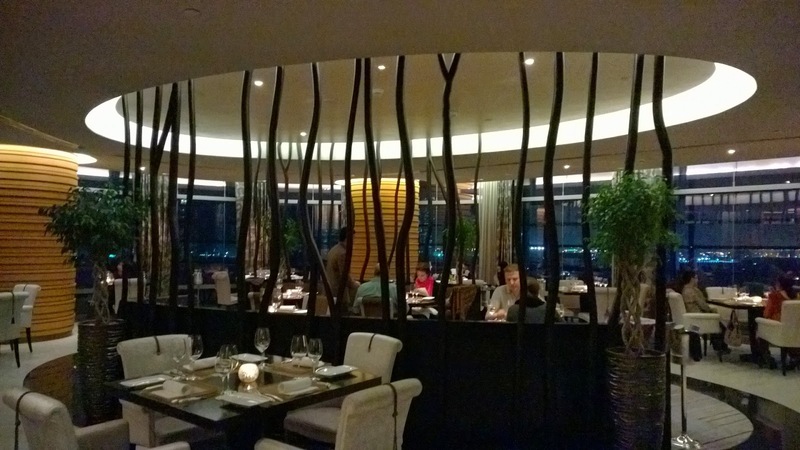 It is a fine restaurant. One of the best in the city. Go and join the gathering. The mela. Spice Mela.